Many people think that the best place for a rosebush to grow is in full sun. And for some bushes, that’s correct. 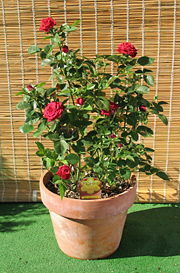 Several common varieties of roses flourish in full sun. Unfortunately, not all of us have full sun in our gardens, or enough space to dedicate our full sun areas solely to roses. Luckily, many varietals of roses can do wonderfully in partial shade. No rose will bloom in complete shade, but some high-flowering roses do even better in partial shade than in full sun. Anything less than six hours of sun will sacrifice some blooms. 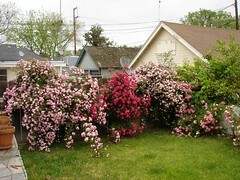 But if you pick a rose with prolific flowers and big blooms you will have a healthy, happy bush. 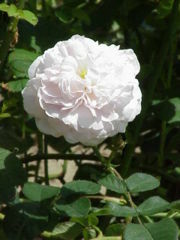 Furthermore, some pale-petaled roses whose colors look washed out in bright sunshine will seem to glow in partial shade. When you buy your rosebushes from your local nursery discuss the best varieties for shade growing for your region. In general, rugosas and floribundas will be your best bet. To plant rosebushes in the shade, first remove the existing soil in the bed. Then, if trees are causing the shade, place a root barrier between the rose bed and the tree roots. Twenty-four inches should be deep enough to keep out most roots. Mix together some good soil, compost, and bone meal and return it to the growing bed. You will want to use a little more compost than for a sunny bed. When it is time to fertilize, you will also want to increase the amount of fertilizer. Make sure you water your roses well. Just because they are in the shade does not mean they won’t dry out quickly. Expect that they will grow a little taller than roses in the sun. Enjoy your shady roses, and Happy Growing!